Saif al-Adl has been indicted in the United States for involvement in the 1998 bombings of U.S. embassies. Cairo, Egypt (CNN) -- Saif al-Adl was a relatively obscure name -- until this week. The former Egyptian Special Forces soldier was well-known in jihadist circles as a senior figure in al Qaeda, but reports of his sudden elevation to the position of "caretaker" leader with the terrorist organization have thrust him into the global spotlight. And that has left some of his old acquaintances in Egypt scratching their heads. One of them is Mohamed Abdel Rahman. He said he fought alongside al-Adl in Afghanistan in 1996, when al Qaeda was allied with the Taliban and battling the Northern Alliance. Abdel Rahman spoke this week to CNN while attending a protest outside the U.S. Embassy in Cairo. That in itself would have been unthinkable just a few months ago, when Hosni Mubarak was still president of Egypt. No leading Salafist Muslim fundamentalist would have dared attend a public demonstration near one of the country's most closely guarded compounds. 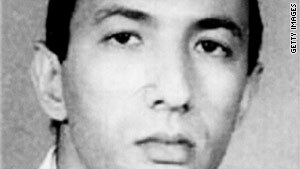 Known among Egypt's jihadist community as the "Lion of Allah," Abdel Rahman is the son of Sheikh Omar Abdel Rahman, who is serving a life sentence in the United States after being convicted of conspiracy following the first bombing of the World Trade Center in 1993. He was at the U.S. Embassy demanding his ailing father's release. Flanked by burly, bearded bodyguards, Abdel Rahman said: "I don't think Saif Al-Adl is qualified to run al Qaeda during this period because, as far as I know, he has been out of the picture -- under house arrest in Iran." Intelligence analysts have long thought that al-Adl went to Iran after the 9/11 attacks, but some sources think he may have returned last year to the Afghan-Pakistan border as part of a deal to free a kidnapped Iranian diplomat in Pakistan. Abdel Rahman said there was no doubt that al-Adl was an important figure in al Qaeda. He "was on the al Qaeda Guidance Council and was specifically in charge of Osama bin Laden's security and mobilization," Abdel Rahman said, referring to the founder of al Qaeda who was killed recently by U.S. forces in Pakistan. But while al-Adl was important in al Qaeda's military operations, he was not an ideological kingpin. "Saif is highly educated and speaks good English, but Dr. Ayman al-Zawahiri is much more qualified for the position," Abdel Rahman said. Al-Zawahiri has long been al Qaeda's second-in-command, and under the organization's constitution should automatically accede to the leadership in the wake of bin Laden's death. In a world of conspiracy theories, Abdel Rahman has his own about reports of al-Adl's promotion. "The Pakistani government may have announced this false information to mislead al Qaeda's fighters or expose them," he told CNN. "I expect Dr. Ayman al-Zawahiri to announce his official leadership of the group within the coming days. It may have been delayed due to security issues." Al-Adl has no shortage of qualifications as an al Qaeda operative. He has been indicted in the United States for involvement in the 1998 bombings of the U.S. embassies in Nairobi, Kenya, and Dar es Salaam, Tanzania, and is alleged to have trained al Qaeda cells in Sudan, Afghanistan, Somalia and Sudan. "He is one tough fighter and highly trained in explosive detonation," Abdel Rahman said. But the man's real identity is a mystery. The photograph of him on the FBI's website shows al-Adl as a young man. Even his birth year is in doubt -- between 1960 and 1963, according to the FBI. There's also doubt about the aliases he may have used over the years. His biography on the FBI's "Rewards for Justice" website lists one alias as Mohamed Ibrahim Makkawi. Abdel Rahman, like other Egyptian jihadists, doesn't recall his using that name. And lawyer Nizar Ghoraib, who has defended many Egyptian jihadists in court, said Makkawi is someone else. "Mohamed Ibrahim Makkawi is an Egyptian former officer in the armed forces indeed, but he is not Saif al-Adl," Ghoraib said. "Makkawi fled Egypt and applied for political asylum and is currently living as a refugee in Afghanistan." But Abdel Rahman does remember al-Adl as a student at Cairo University at the end of the 1970s before he joined the Egyptian Army and rose through the ranks to become a Special Forces officer. Al-Adl then joined al-Zawahiri's group, Islamic Jihad. By his own account, written in 2005, he was detained in May 1987 in relation to a coup attempt planned by Islamists; he left Egypt in 1988 to join the jihad against the Soviet occupation of Afghanistan. Esam Daraz, a former Egyptian military intelligence officer and documentary film-maker, also knew him. He followed Osama bin Laden and al Qaeda in the early days of their struggle against the Soviets and is known for his film "Arab Supporters in Afghanistan." "I met Saif in the battle of Jalalabad when the Americans were supporting the jihadists against the Soviets," Daraz said. "He was training the fighters how to use the Stinger missiles supplied by the U.S. He refused to let me photograph him." Daraz agreed that al-Adl did not use the Makkawi alias. Al-Adl was born in Mounofiya, a small agricultural town about an hour's drive from Cairo. An area where farmers raise cattle and breed chickens, it is hardly a hotbed of jihadist activity. Despite its modest size, Mounofiya was also the birthplace of Egypt's last two presidents -- Mubarak and Anwar Sadat. It's long been rumored that al-Adl may have been involved in the plot to assassinate Sadat, who was killed by Islamic extremists during a military parade in 1981 in Cairo. But a man who just completed a 30-year sentence for his involvement in the assassination has denied al-Adl had anything to do with it. Aboud Al Zoumor, a former Egyptian Intelligence officer, told CNN: "Saif comes from another generation. He was too young back then and he was never part of any Jihad organization in Egypt until he moved to Afghanistan and found his calling." Abdel Rahman told CNN he thinks al-Adl has four children with a woman he married in Kabul. He said he last saw him in 2002 in Pakistan before al-Adl made his way to Iran. "We played football with a group of fellow jihadists, then had lunch before I left," Abdel Rahman said. "He was a really good football player, sharp and fast."